The Knit Rite Sterling Prosthetic Sock was first developed in 1921. Since that time, the finest materials have been combined with the most innovative technologies to create a premier prosthetic sock. The Sterling Prosthetic sock features a reinforced toe, a more rounded toe and the absence of any open stitching. All Sterling Socks are treated with a colored thread at the hem so the patient can determine the ply after washing. Sterling Prosthetic Socks are available in Wool, Sterling Stretch, or Cotton. The Sterling Wool sock is a blend of virgin domestic wool and Australian wool. This blend provides the right about amount of stretch while still being soft. One and two ply socks are 100% Australian wool. Both are machine washable. The Sterling Stretch Sock contains Cool-Max and Lycra so the sock conforms to the shape of the limb. The Cool-Max also allows for moisture wicking. This sock is fleeced on the inside which adds further comfort. Cotton Sterling Prosthetic Socks are absorbent and hold their shape. Shrinkage is minimal and can be mash washed. 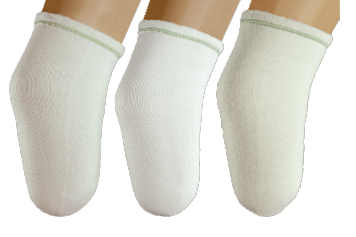 For more information about the Knit-Rite’s Sterling Prosthetic Socks or to find a provider, please visit us online. This entry was posted in Our Products and tagged Cool Max, Inc., knit rite, Lycra, moisture wicking, prosthetic sock, soft socks, sterling soft sock. Bookmark the permalink.